Happy Thanksgiving to you! It’s been such an amazing year full of weddings, new clients and our loyal regular clients. We still have many weddings left for 2016 so we are taking a short break. 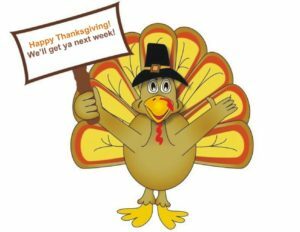 We will be closed Wednesday, November 23 through Friday November 25th. Reopening on Saturday November, 26th. Watch for our BLACK FRIDAY Deals and our 12 days of Christmas specials on ALL services! Wedding Makeup, Skincare, Lash Extensions and GloMinerals Makeup! This entry was posted in Reviews and Compliments and tagged black friday deals, Boston Spas, bridal makeup, Chemical peels, GLOMinerals, lash extensions, Lash tinting, Melrose Spas, Microderm, Spa Deals, Spa packages, Stoneham Spas, Wakefield Spas.